When I focus on my own game, what I am doing, what I am learning, what I am enjoying, what I have in my life, what I’m looking forward to, what today is all about, what challenges I am stepping up to meet – then life seems good. Full. Rich. Interesting. Worth living. When I start comparing myself to others, all that changes. I start to feel less than. Minimised. A bit like a failure. Or like I’m wasting my life. Comparing yourself to others is an easy trap to fall into. You don’t even have to try — especially if you spend any time at all on social media — to find yourself wondering about someone else’s life, and how much better it seems to be than yours. Instead of stopping at the point where we notice someone else’s life (or what is visible to us at this moment in time) and acknowledging, honouring or appreciating it, we go the extra step and compare what their life is like (or what is visible to us at this moment in time) to ours. And the result is we often feel inferior and less than, or we feel superior and better than. Neither of which is a happy and generous place to reside in. It’s damaging to your sense of self. 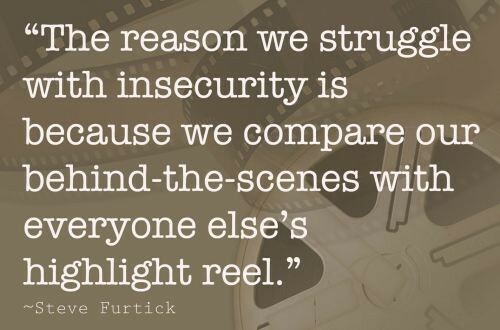 What you are comparing yourself against is inaccurate information. It doesn’t actually help you accomplish your goals. They conclude that it’s a losing battle. And I agree. Which is why I have to bring my attention back to my own ‘lane’, my own race, my own game, my own playing field, when I find the temptation of the comparison game tempting me. I’m at a local open air market. We are so fortunate on the Sunshine Coast, where I live, in that we have many open air markets. They are almost all full of local stallholders selling lovely unique and locally made/sourced products. 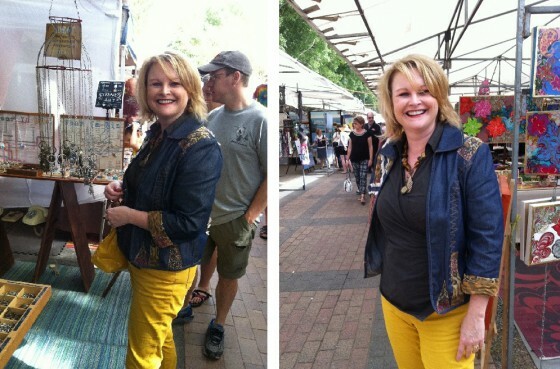 This is me at the biggest of our local open air markets, the famous Eumundi markets, enjoying a beautiful spring morning out with my husband – looking at interesting and beautiful items, listening to local artists, and eating delicious and nutritious locally made food.